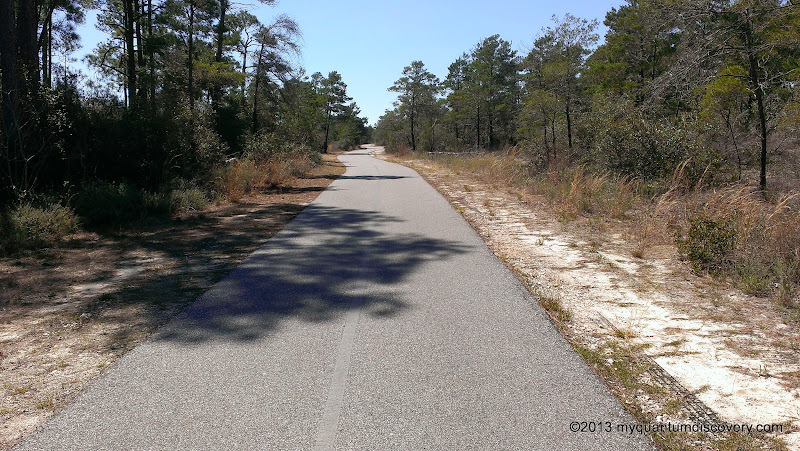 One of the things we love about Gulf State Park is being able to bike or to walk on the Hugh S. Branyon Backcountry Trail. 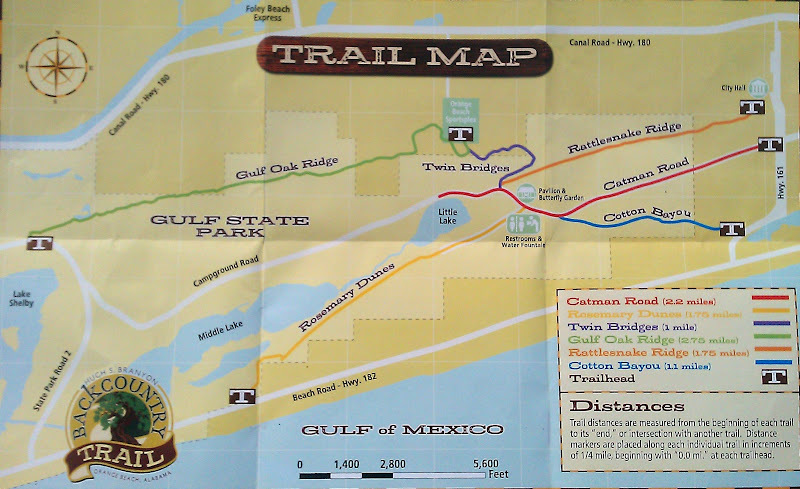 Consisting of six trails, totaling nearly 11 miles of paved, multi-use paths, this trail is named for the long-time Gulf State Park Superintendent who managed Gulf State Park from 1970 until his retirement in 2009. 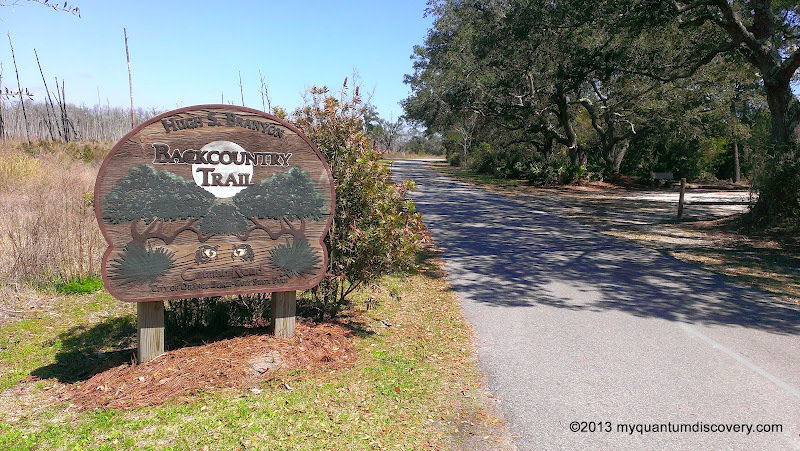 The six trails pass through six distinct ecosystems: wet pine flatwoods, live oak maritime forests, coastal dune and swales, longleaf sand ridges, freshwater marshes and coastal hardwood swamps. Over the course of our stay there we covered all of the trails on several different days, even pedaling well over 14 miles on one day (ouch, do you want to hear about all of our sore body parts that night?). Four of those miles weren’t on the actual trail but riding through the campground – the distance from our campsite to the start of the trail and back again was over 4 miles. The bike trails are awesome but biking through the campground isn’t my favorite thing, too many vehicles, kids and other bikers. Other rides weren’t as long, usually averaging about 5 – 7 miles. The highlight of the 14 mile ride was seeing “Lefty”, the resident American alligator who lives in the marshes on the Rosemary Dunes Trail. She is so named because she lost her right foot (claw? paw?) and her right eye during a fight with another alligator. Rumor has it that she was rescued by the staff in the park, nursed back to health and then released along the trail. 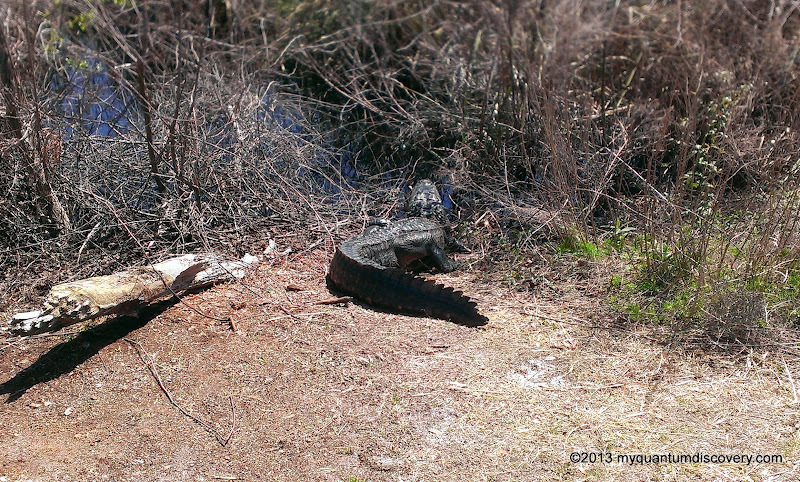 Pretty cool seeing an alligator in the wild up close (well, not too close) and personal (and not that personal). That particular day she was basking in the sun, just laying there doing absolutely nothing and being quite photogenic on the edge of the marsh about six feet from the b ike trail. Nearby hiding in the marsh grass were two of her three baby gators. Too cool! On our second ride along the Rosemary Dunes Trail, we spent some time searching for geocaches (yes, it is very addictive). 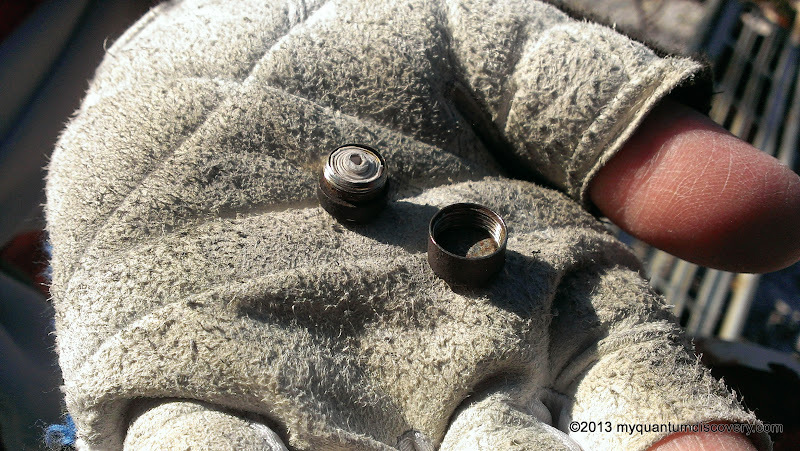 It was our lucky day – we found five of of the treasures! Our typical “modus operandi” of eating breakfast out shifted during our stay at Gulf, mainly because there weren’t that many good, inexpensive restaurants in the area. So much to my joy, we would go out for a late lunch and then instead of supper we would just have a snack later in the evening. Thank goodness we’ve been exercising a lot! 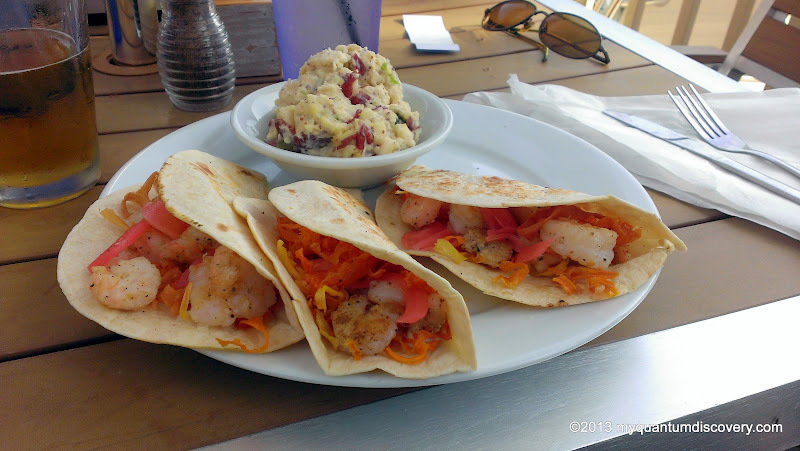 After our very long 14 mile bike ride, Rob and I decided we deserved a reward for all our hard work so we headed (in the van, not the bike) towards the Perdido Pass Bridge where there is a rather unique restaurant called The Gulf Restaurant. 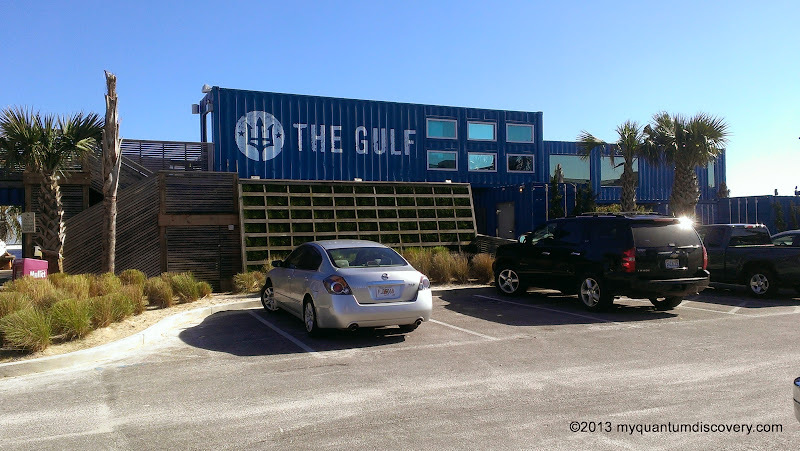 Created out of four bright blue shipping containers, this place will definitely catch your eye. With a somewhat limited menu consisting of burgers ($7.50), grouper sandwiches ($12), several salads and several other daily entree specials, it may be a little pricey for a primarily self-serve establishment, but boy, oh, boy what a view! Guess the saying that it is all about location, location, location holds true in this case! 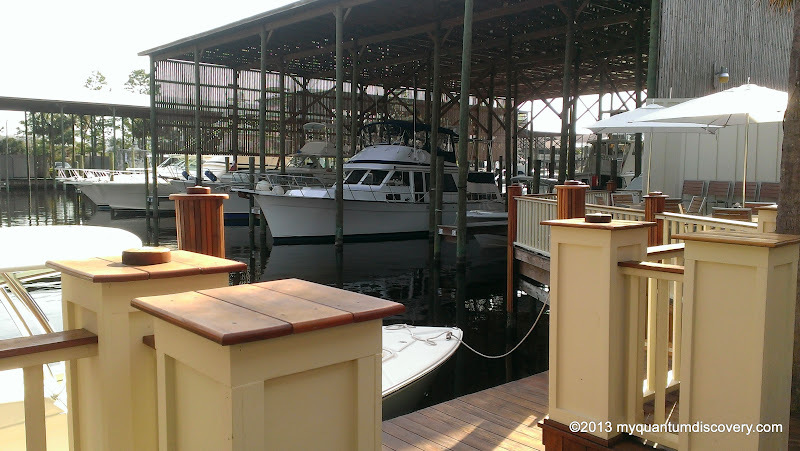 The location is right at Perdido Pass (an inlet from the Gulf of Mexico) and besides the emerald waters of the gulf, there is an attractive bridge over the pass, white sand beaches and lots of boating traffic to entertain. And you can’t beat the “decor” – your pathway to the various seating is not just sand but very lush green so d (complete with an irrigation system). White beach sofas on area rugs, huge round chair pods (some with hoods), picnic tables and surrounding tall palm trees make up the very tropical, oasis like, outside dining area. Because most of the seating is outdoors, if the weather is bad they won’t be open. Choose your selection from the chalk board menu, place your order at the window where you are given a number to put on your table, then find yourself a seat. Alcoholic beverages need to be ordered separately at the nearby outdoor bar. When your order is ready, it will be brought to you. Since we had been out in the sun all day during our bike ride, we sat at one of the picnic tables which was shaded by a palm tree but it turned out to be a little chilly so after we finished we moved to a sunnier table to warm up a bit. 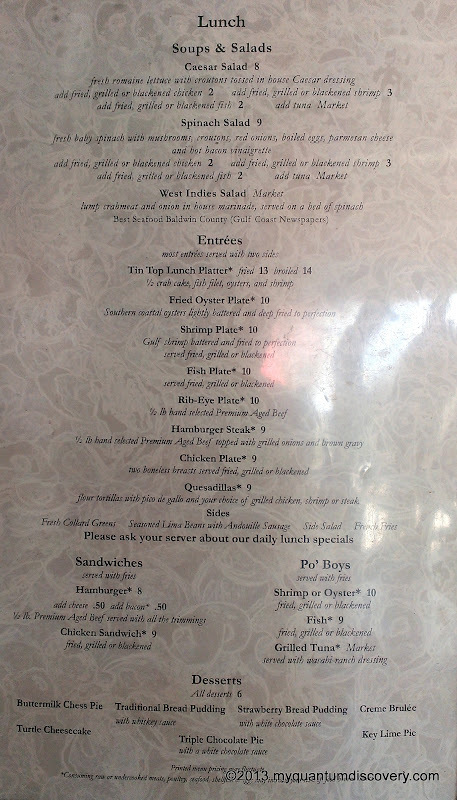 Rob and I both had the fried grouper sandwich accompanied by an order of hand cut french fries ($4). Excellent! After we finished our lunch, we walked back towards the entrance, passing by a rather large antique spotlight, then taking the stairs up to check out the second level where there are a few small tables. Expecting typical exterior wooden floors? Surprise, instead we were walking on lush, green sod! Pretty neat! 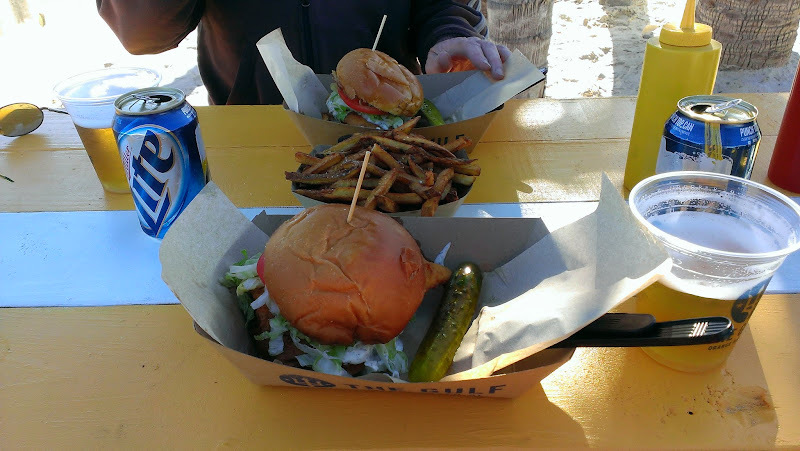 Overall, we were pretty impressed with the place – the staff was friendly, the service was prompt and our sandwiches and fries were quite good. If you’ve never been there, it’s definitely worth a visit – even if you don’t want lunch just walk in and check it out! 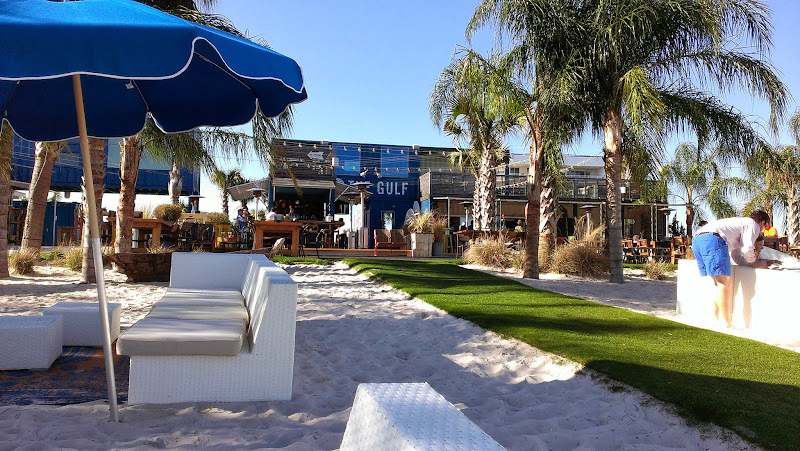 How can we visit Gulf Shores without visiting our favorite restaurant – Shipp’s Harbour Grill, located at the Sportmans Marina Complex at 27842 Canal Road in Orange Beach? Recommended to us by the staff at Heritage Motorcoach Resort back in 2011 (before we were blogging), we went there several times during our stay in the area in 2012. 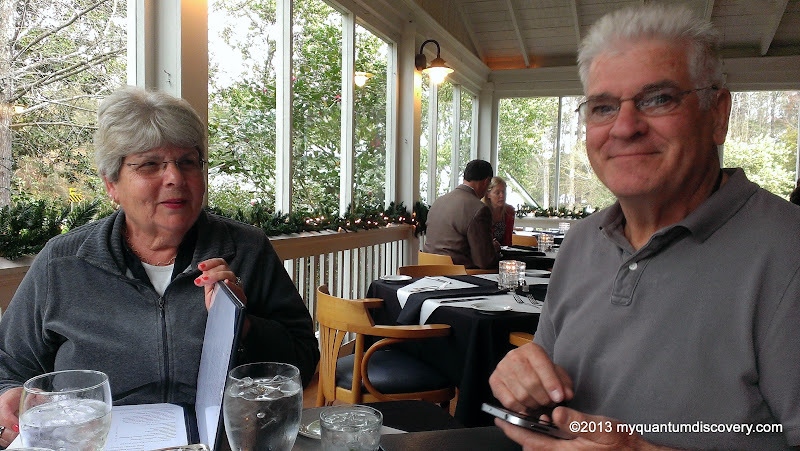 On Thursday, March 20th, we enjoyed a fun day (more about that later) with Rob’s aunt and uncle, Linda and Herb, so a late lunch at the Harbour Grill was a must! Rob and I had debated going there after 5 pm for their Thursday night steak night (8 oz Angus steak filet for $16.95) but decided a late lunch would work out better from a timing perspective. After being seated, Linda and I ordered Mango Margaritas while the guys had beer. 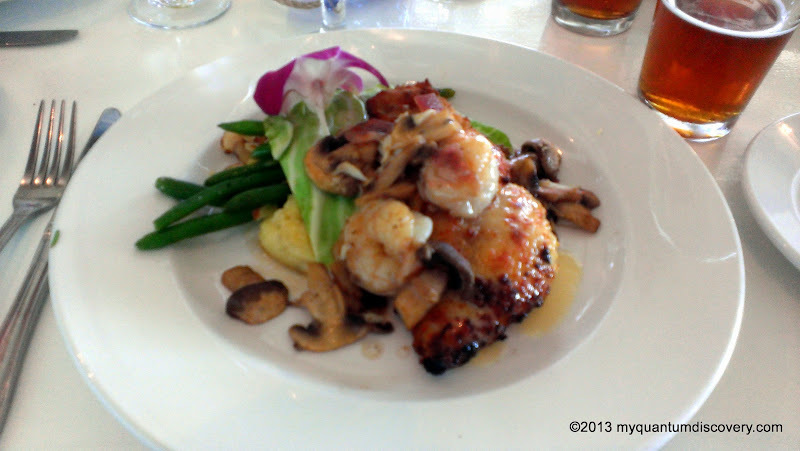 For our entrees, Herb, Rob and I all ordered our usual favorite (and why we keep coming back), Grouper Ponchatrain (fresh grouper, shrimp, mushrooms, onions, lemon butter and served with smoked gouda mash and green beans, $14.95) while Linda had the Black Sesame Tuna (Ahi Tuna “rare”, black sesame seeds, sesame soy reduction $12.95). Everything was soooo delicious! Service was excellent but our waiter was a little “weird”, kept telling us stories about carrying a weapon and told us that on a trip he had taken he brought along two friends – turned out his two friends were “Smith & Wesson”. Very strange conversation to say the least! Our dessert that particular night wasn’t anything edible – instead later in the evening we were served another glorious sunset! Best part – no calories! 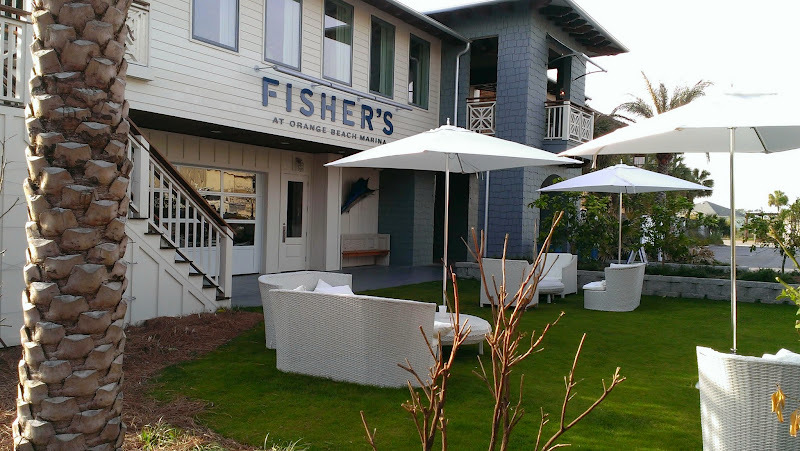 Another new restaurant in town, opened in June of 2013 – Fisher’s at the Orange Beach Marina, located on Marina Road. 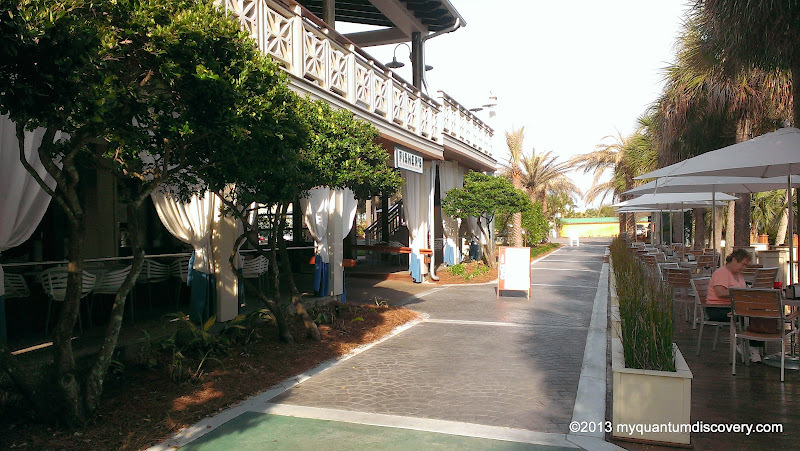 Fisher’s was opened by the same person, Johnny Fisher, who opened The Gulf Restaurant mentioned previously. In this two story restaurant, there are four bars and two dining rooms. 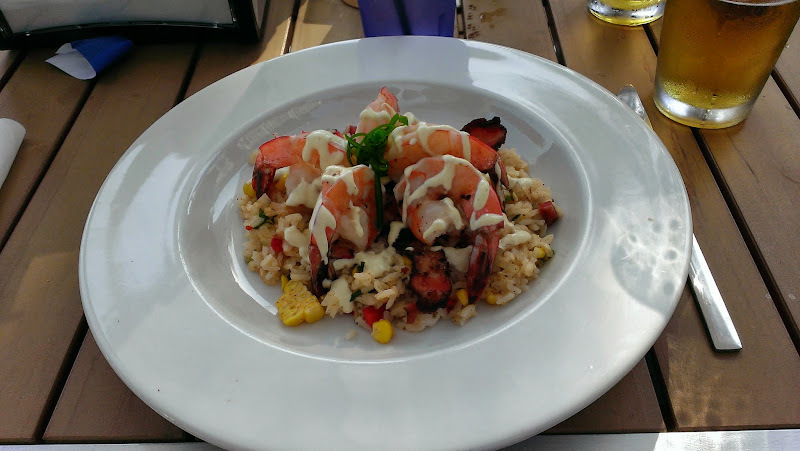 The more upscale upstairs has open air seating with a bar as well as an indoor dining room while the lower, more casual (and much less expensive) “dockside” restaurant has an open air view of the marina. Arriving around 3 pm we asked to be seated outside (despite the fact that it was beginning to get cool) near the marina. After perusing the menu, Rob decided to try the Shrimp Tacos – three shrimp soft tacos served with pickled onions and radishes with fried parsnips with potato salad ($13.95) and I ordered the Shrimp and Tasso Rice – 5 large sauteed shrimp with house made tasso (smoked pork) and jalapeno sour cream over charred corn rice ($12.95). Both dishes were excellent! Although a word of caution, my shrimp was quite spicy! 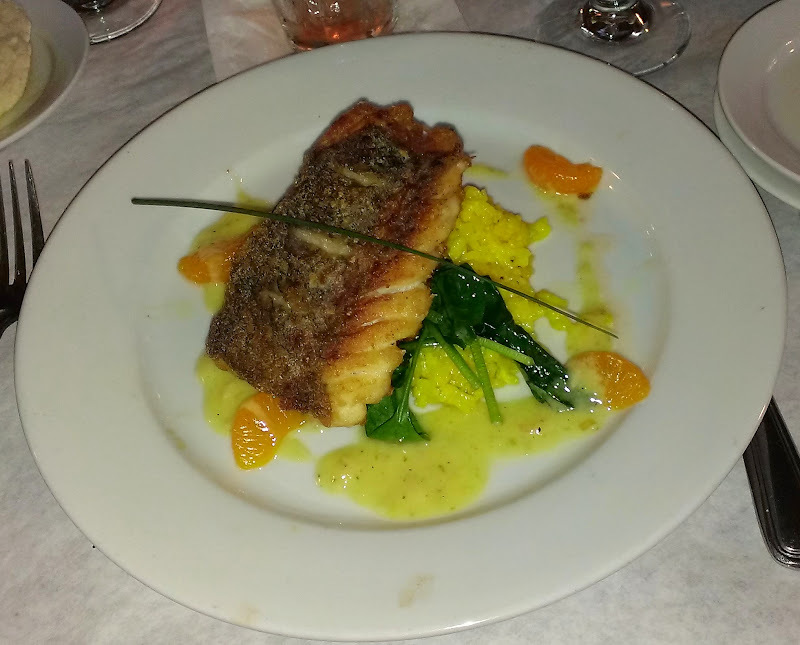 For a casual meal, wonderful ambiance, delicious food and excellent service, be sure to visit Fishers. Based on the reviews, a visit to the upstairs restaurant might be worthwhile. Maybe we’ll try that next time we are in the area. We really liked the pleasant “yachty” non-commercial marina environment and it stirred up some pleasant anticipation as we look forward to getting our boat, Quantum Leap, back in the water around mid-May back in Narragansett Bay, RI. 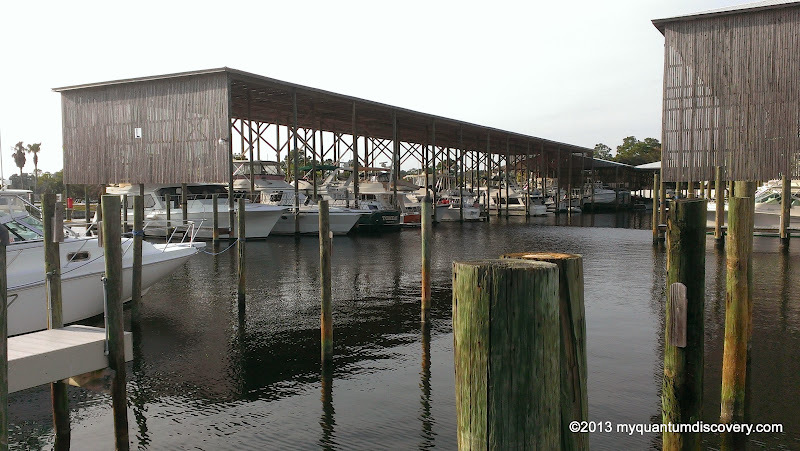 After our late lunch we walked around the marina for a bit checking out the water craft, then finally headed back to the campground, stopping at a few scenic spots along the way. 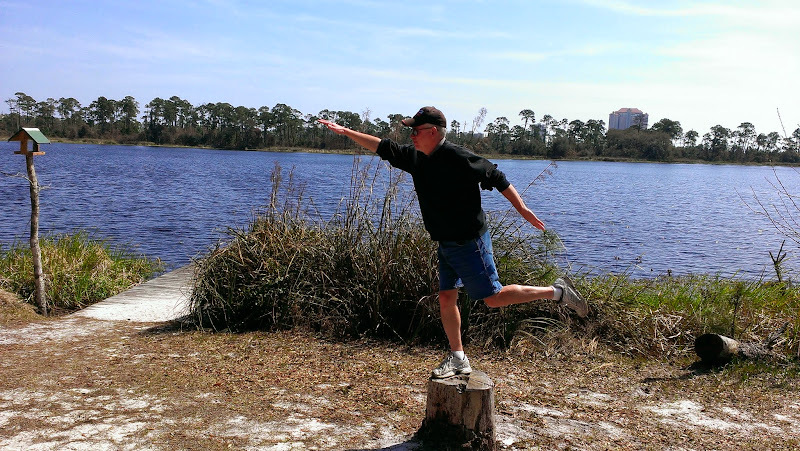 One of the stops was at Boggy Point, which is part of the park system and closest to the Perdido Pass Bridge. While here, we went in search of a geocache which we found pretty quickly. 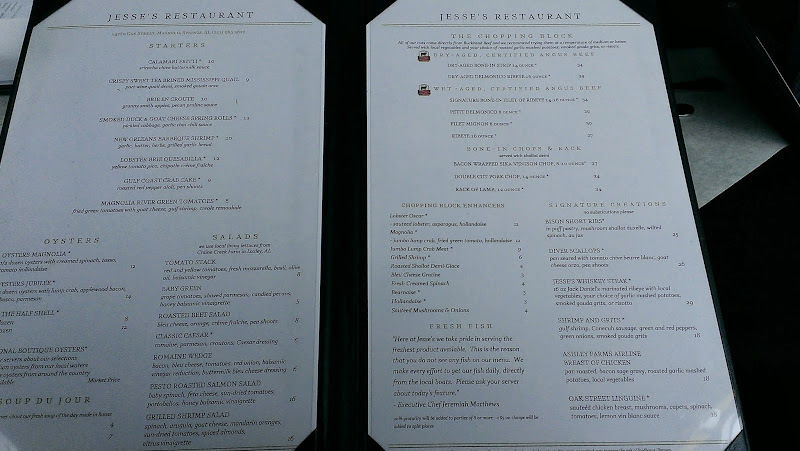 We did take a day of rest (Saturday) from all of our eating out but we had another restaurant we had heard about from several people on our previous trips that we wanted to try. Since our time was growing short at Gulf Shores, we decided to go there on Sunday for a late lunch. 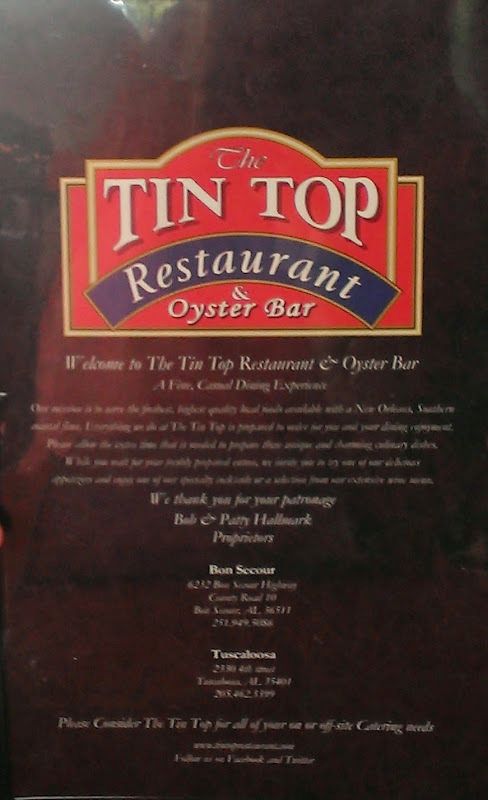 Tin Top Restaurant has two locations – one in Tuscaloosa and the one we went to in Bon Secour, about 13 miles from Gulf Shores. 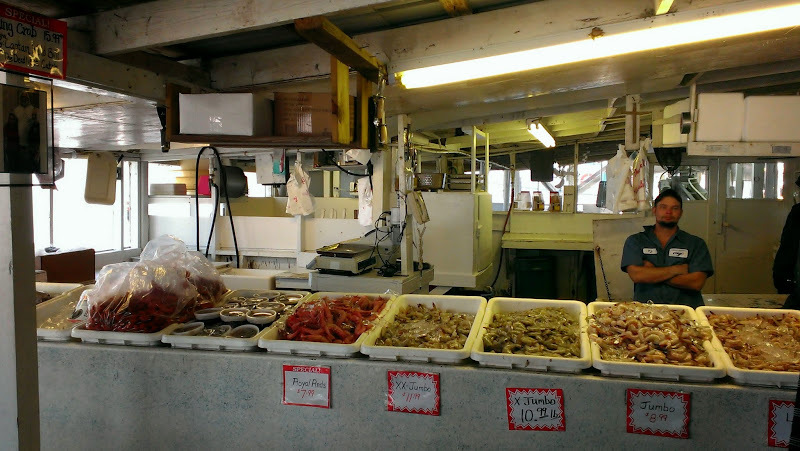 Another reason for going there was to go to Billy’s Seafood Market which is just a few miles from Tin Top. Duh, it was Sunday and of course, Billy’s and Aquinas Seafood were both closed. What was I thinking?? This day was pleasantly warm and the side panels on the outside porch were down so we opted to sit on the porch instead of inside. 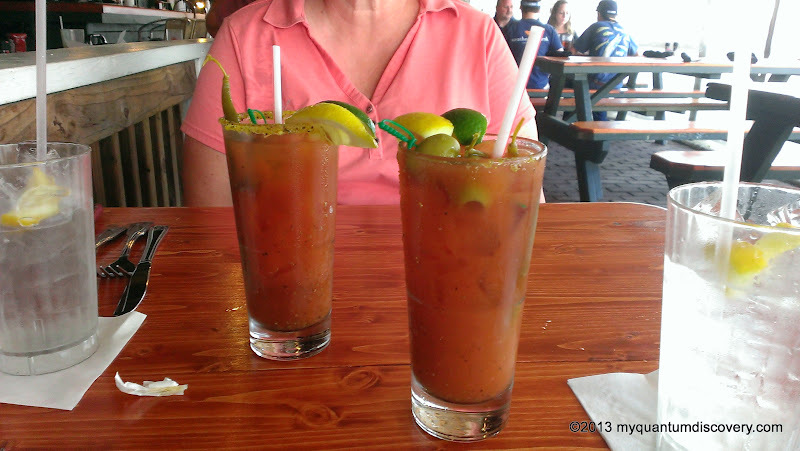 They had a special on Bloody Mary’s so we decided to order two of those. Not only was it a meal by itself – our glasses were adorned with olives, pickled string beans, a lemon, a lime and a shrimp but it had just the right spicy kick to it. Since we had heard that their fried oysters were very good, we decided to order the fried oysters from their luncheon menu ($10) with a side of lima beans. Definitely lived up to their reputation! Really good! 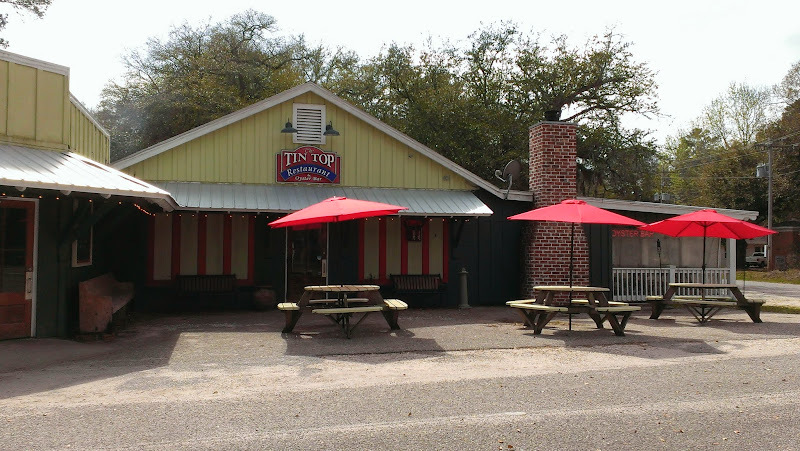 If you are in the area and want to eat somewhere that is off the beaten track and away from all of the touristy hubbub in the Orange Beach/Gulf Shores area, we highly recommend a visit to Tin Top. Monday, the 24th, ended up being a very busy and very filling day! 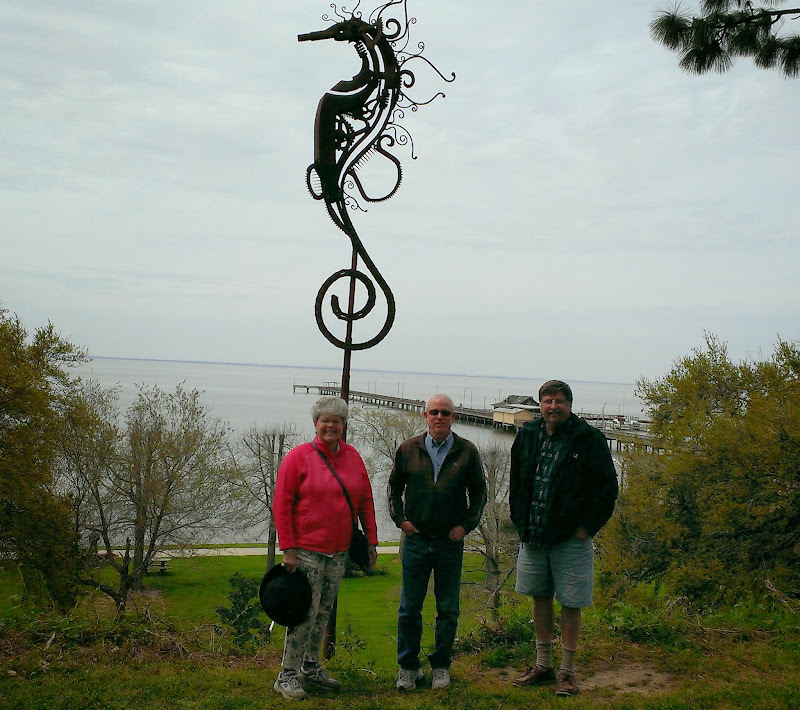 Pam and Roy, our friends from Texas had called – they were on their way back from the FMCA rally in Perry, GA and planned to stay at Meaher State Park in Spanish Fort (near Mobile). Could we get together? The only time that seemed to work out for all of us was to meet in Fairhope for an early lunch at Panini Pete’s on Monday. Since we were meeting up with Linda and Herb that night for dinner, we agreed to meet at 11:00 am. Once we arrived, we decided to eat inside since it was chilly and rain was threatening. The decor inside was attractive, however it was busy and therefore very noisy due to the hard glass walls. 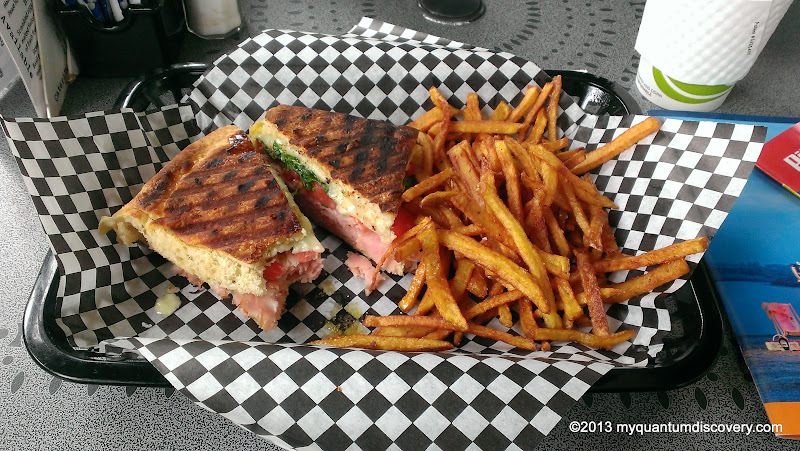 Pam & Roy ordered our favorite panini’s – the roast turkey and the muffaletta while Rob and I had their special panini – a ham and cheese with arugula on focaccia. So yum my! Pam & Roy had never been to the waterfront at Fairhope so after lunch, we all hopped in our van and drove down to the pier, then took a walk in the park up along the bluffs. Such a wonderful visit we had! It was with reluctance we all said goodbye and went our separate ways but only after promising to stay in touch and to possibly make plans in the near future to meet again. Rob’s aunt & uncle, Linda and Herb, had been to this restaurant last winter and wanted to go this year so they invited us to go with them. Since they were leaving to head back to RI on Friday, the 28th and we were leaving to head to our next destination on the 26th, it was decided that we would go there on Monday, the 24th. 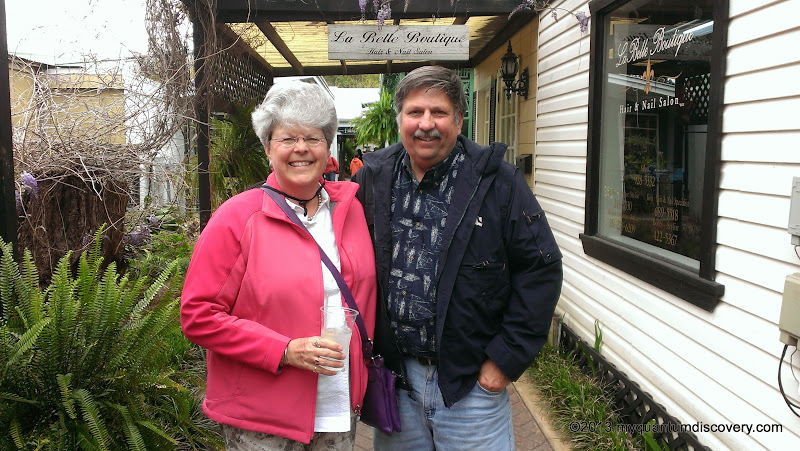 Linda invited us over to their coach at Magnolia RV Park II around 3 pm, making reservations for dinner at 6 pm. 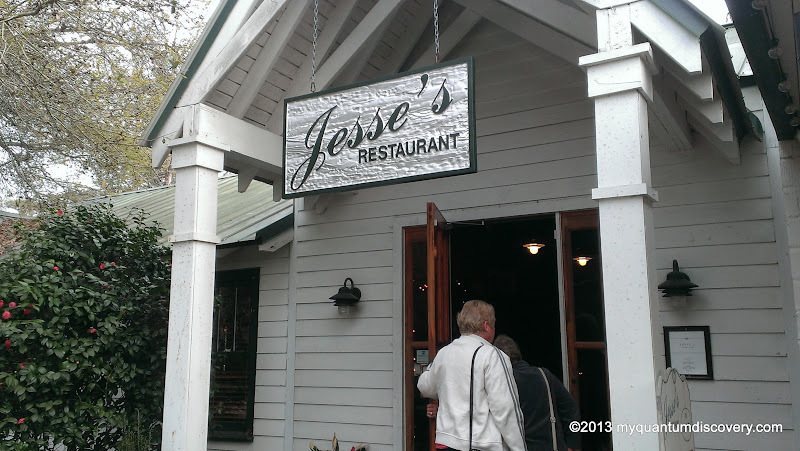 Located in Magnolia Springs about 20 miles from Gulf State Park, Jesse’s is definitely off the beaten track. And definitely not where you would expect to find a fine dining restaurant. It is located at what used to be Moore’s Bros. Store, built in 1922 and serving the community until 1993 when it closed. The building is listed in the National Register of Historic Landmarks. If you are not interested in “fine dining”, the same food is served in the adjacent pub-like “The Cold Hole” in a more casual atmosphere. Lunch is also served from 11 am to 4 pm. 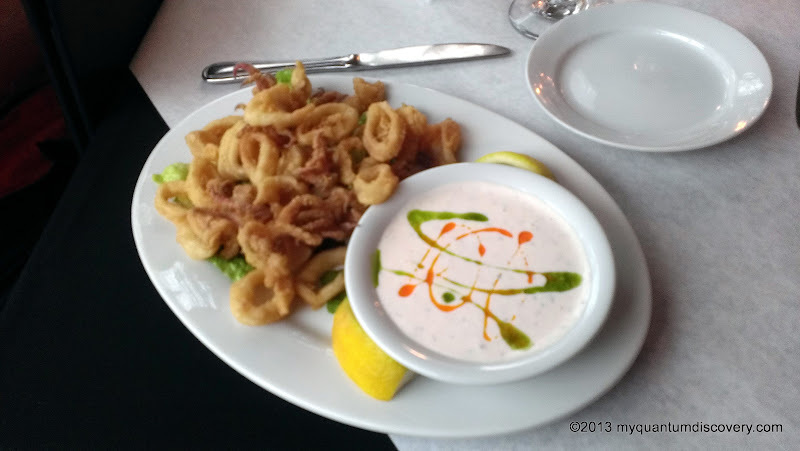 We started off with two appetizers to share – Fried Green Tomatoes (fried green tomatoes with goat cheese, gulf shrimp and creole tomato coulis) and Calamari with a sriracha chive buttermilk sauce. Delicious! Then for entrees, Rob had their Petite 8 oz Delmonico steak, Linda and I had their special fish of the day – snapper with citrus bleurre blanc sauce with saffron risotto and wilted spinach and Herb had the dry aged 16 oz (yes, that’s not a typo – it was 16 oz as in 1 pound) dry aged angus Delmonico Ribeye. Unfortunately he ordered it medium rare but it came out still moo’ing so he had to send it back. 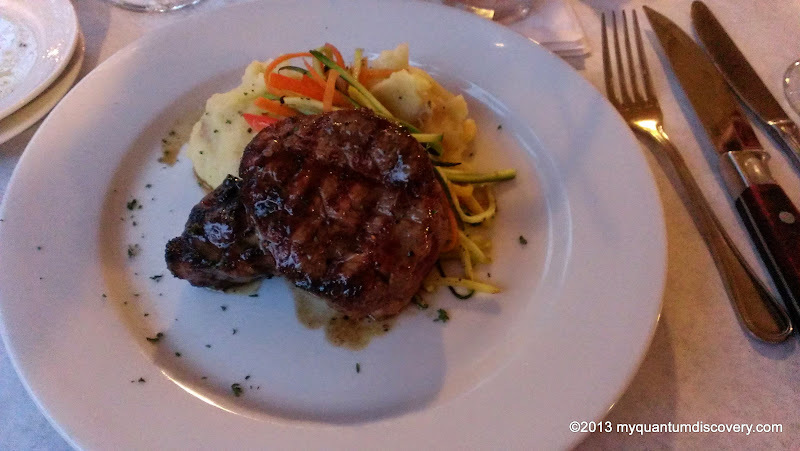 Both steak entrees were served with garlic mashed potatoes. Needless to say, Herb was the only one with leftovers! Well, on the Monday before we were to leave, after listening to a little whining from me, my wonderful hubby agreed to take me back to Billy’s. Back in 2011, we bought some shrimp here and it was so good. In New England the only shrimp we can buy is frozen so having fresh shrimp right off the boat is a real treat! So off we went in the hunt for fresh shrimp! We ended up buying 2 pounds of the jumbo shrimp. That night we boiled it, adding some Zatarain’s seasoning to the water. Yummy, it was so good. 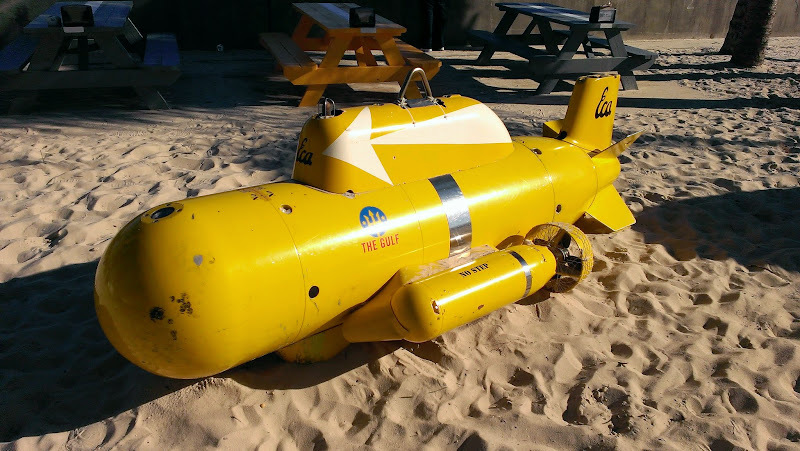 The “and…” in the post title hints about one more really fun thing we did in Orange Beach, but you’ll have to read about that in our next post!